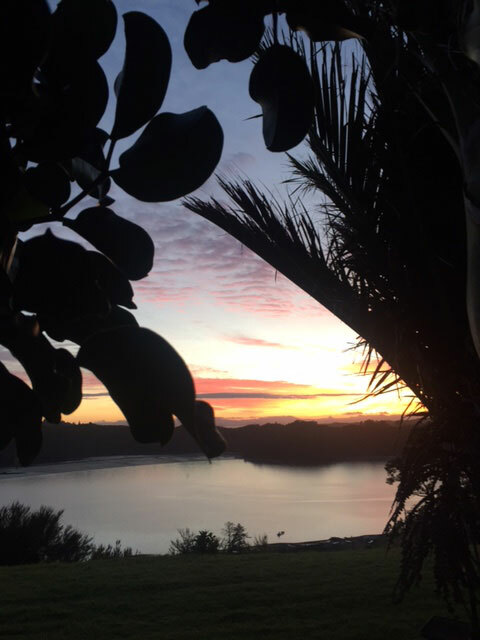 Te Matuku Oyster farm lies in nutrient-rich, unpolluted Te Matuku Marine Reserve at the south east corner of Waiheke Island in the Hauraki Gulf. Surrounded by regenerating native forest, Te Matuku Bay provides a perfect marine environment for pacific oysters to flourish. Not surprisingly it’s where one of the earliest Government oyster leases was granted in 1971. 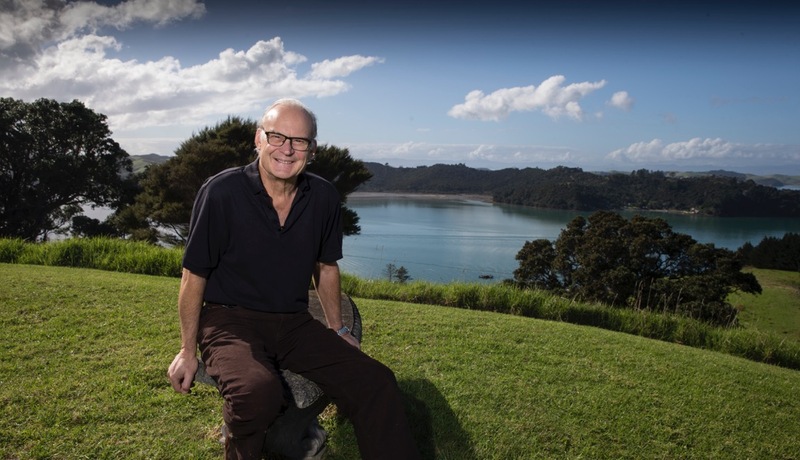 In the 1990s, conservationist and businessman Sir Rob Fenwick and his wife Jennie, who own Te Matuku forest and farm property adjacent to the oyster farm, rebuilt the oyster farm. With other investors whom they later bought out, they used state-of-the art oyster farming technology with suspended Seapra baskets replacing traditional timber rack and rail structures. The new method significantly improves tidal flows and minimises detritus on the seabed, dramatically reducing environmental impacts of the farm. Nat Upchurch joined as manager in 2002. Waiheke born with a Batchelor in Marine Biology, Nat has been the driving force in the evolution of Te Matuku Oysters, carefully developing the many attributes that make them unique and instantly recognisable. Nat was determined to create an oyster with distinctive texture, taste and flavour, be easy to shuck and that would grow quickly in the farm. It was his dream ultimately to produce oysters that consumers could enjoy fresh all year round, by developing an oyster that did not spawn. Working with world renown research partners, Cawthron Insitute of Nelson, Nat achieved his goals. Today food writers from Rick Stein to Martin Bosley acclaim Te Matuku Oysters among the best in the world. Plump and firm with a burst of sea flavour, Te Matuku are listed on leading restaurant menus throughout New Zealand. Freshness is critical to oyster enjoyment. With the farm situated close to Auckland by ferry, means Te Matuku oysters can be eaten in many parts of the country on the day they’re harvested. To maximise freshness, Te Matuku led the oyster industry in persuading restaurant and bar owners to buy oysters live and shuck them to order. The innovation has transformed oyster lovers’ enjoyment and increasing numbers of consumers have learnt to shuck their own. Nat’s wife Duana runs the popular Te Matuku Oyster Shop in Ostend on Waiheke and Duana’s sister Shelley Foster heads the trade sales effort to restaurants, bars, caterers and hotels throughout the country. In 2017 a nationwide on-line purchase and home delivery service was started. In 2015 the Simoni family from US bought land in nearby Awaawaroa Bay which came with an oyster lease in the bay. When incorporated with the existing leases, the size of the operation could double and Carlo and Anne Simoni became partners in the business. Oyster lover Sir Rob Fenwick says Te Matuku oysters are instantly distinctive and recognisable. “They’re consistently plump and firm in the mouth any time of the year and they always give you that little burst of salty freshness from the sea. And they’re easy to shuck yourself. “I’m very proud the farm has minimal impact on the marine environment. There is no sediment on the seabed; we’re reducing the use of tantalised timber in the sea and our emissions, waste and water discharges are all minimal. 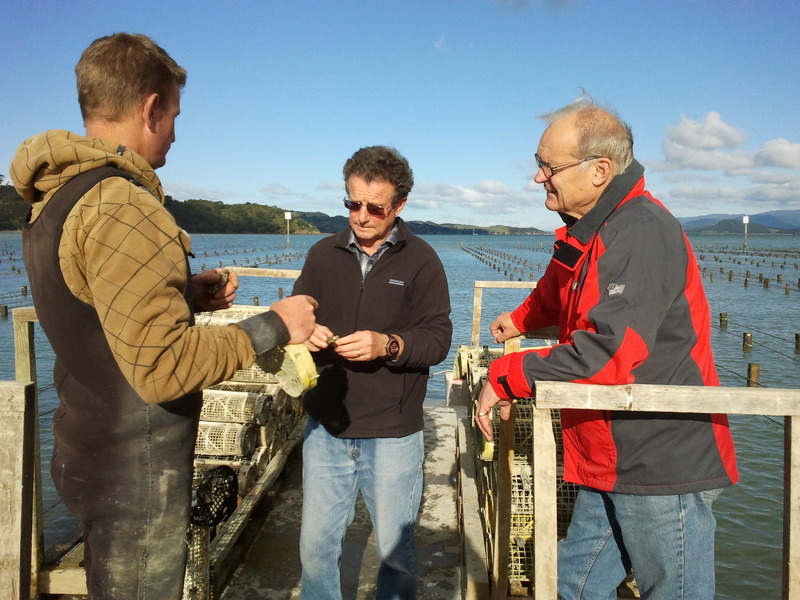 Photo above: Nat on the oyster barge with Cawthron Research CEO Dr Charlie Eason (centre) and Sir Rob Fenwick (right).